All CLICK® DECOTM wiring accessories featured are available in 9 distinctive quality finishes: Antique brass*, polished brass, polished chrome, satin chrome*, satin brass*, black nickel, pearl nickel, stainless steel and Georgian style cast brass. *UK Design Registration 3015621. 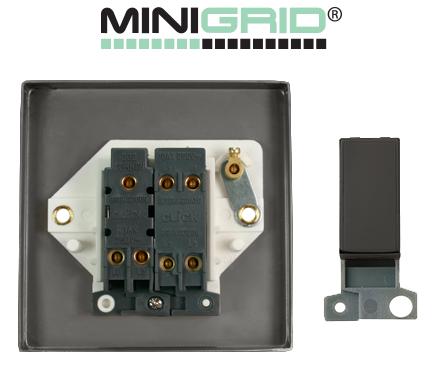 All CLICK® DECOTM wiring accessories are available with black or white inserts, excluding antique brass and black nickel finishes which are supplied with black insert and gasket only. When ordering any CLICK® DECOTM wiring accessories, please specify the required finish by following the simple code structure as demonstrated here.